"It’s amazing what has been achieved in such a short time, and the same can be said of our academic and teaching endeavour over the last five years." On a flight home from holiday in 2010, a University senior leader had a chance conversation with a local eye care specialist, who questioned why – when the south-west urgently needed eye care specialists – Plymouth didn’t offer an optometry degree. Fast forward to 2016, and two optometry cohorts have graduated, student numbers have more than doubled, and nearly £1 million has been secured in research funding. It’s safe to say that optometry has been an eye-opening success. It took less than nine months from that original meeting for the optometry course to be professionally approved, with the first students welcomed in 2011. And as the University’s School of Health Professions celebrates the course’s fifth anniversary, Dr Phillip Buckhurst, Associate Professor in Optometry, reflects on how far it has come since the very beginning. The course, like many of those in other health professions, is a balance of research-informed teaching and clinical practice. From their first year, students observe and assist local opticians, and in 2013, the University opened its Centre for Eye Care Excellence (CEE), based near the main campus on Gibbon Street. The practice offers students the chance to carry out supervised training on members of the public and such is the success of the initiative – and the growth in student numbers – that CEE has expanded onto the campus itself, with a second practice opened in November 2016 in the Wellbeing Centre. Both facilities, which follow a model similar to the Dental Education Facilities, are home to advanced instrumentation and used by undergraduate and postgraduate students, with qualified optometrists on hand to supervise students and deal with more complex patients. Students, particularly in their final year, spend a lot of time with members of the public: from contact lens clinics and spectacle dispensing to paediatric care, they experience everything encountered by a real-life optometrist. Most clinics are free of charge, and customers receive 20 per cent off the list price of any spectacles if they sit for a student. As well as welcoming people genuinely looking for eye examinations, the centres have a number of volunteers who kindly sit for the same test with several different students, and new patients are always being sought. To complement the hands-on learning, the 13-strong team of academics prides itself on teaching both theory and transferable skills. For example, a second-year module delves into entrepreneurship, with emphasis on investigating the legal and ethical issues around managing a business. The team’s research activity has in turn fed into its teaching, including in areas such as binocular vision and neurophysiology and a range of eye diseases. Around £900,000 has been secured in research funding in its five years, with specialisms in myopia (short-sightedness), glaucoma and vascular disease, visual psychophysics, and cataract and refractive surgery. Interdisciplinary projects have also been undertaken by the Eye and Vision research group in the Institute of Health and Community, with studies alongside psychologists on how variations in vision can affect cognitive process, and research alongside other health professionals on how vision affects balance. The course is also currently overseeing seven PhD students looking at various aspects of vision science, including one investigation into how the use of smart technology affects the eyes and vision. This research topic of choice sums up what many students have praised about the course – its relevance to the real-life profession and everyday life. Such has been its level of success that 95 per cent of its 2015 graduates went on to full-time employment or study within six months of leaving, and its NSS scores show that 89 per cent of its students found the course intellectually stimulating. 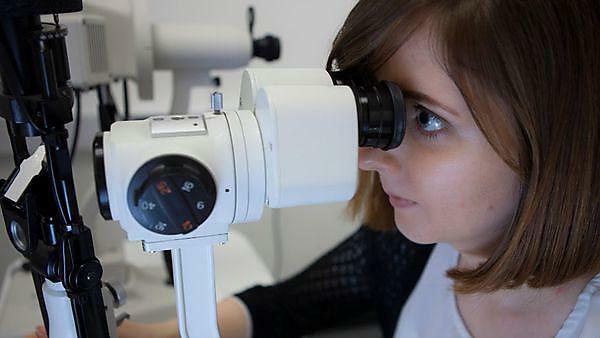 Learn more about BSc (Hons) Optometry. Benefit from hands-on experience from the start, a graduate employment rate of 100 per cent (unistats) and good jobs prospects in the region. Our on-campus eye care clinic will connect you with clients, practising optometrists and potential employers while providing eye care services to the University community and beyond. Whether you decide to work in high street practices, alongside other healthcare professionals in hospitals or make your mark in vision science research, throughout your degree we’ll help you plan for a successful career. See where your career could take you.